The team that brings visitors to Rüsselsheim closer to the fascinating world of car manufacturing: Dimitrios Salabasis, Irina Scherer, Ramesh Niebling, and Viktor Zobel (from right to left). car manufacturing, concentrated knowledge – and now even more custom-tailored communication. 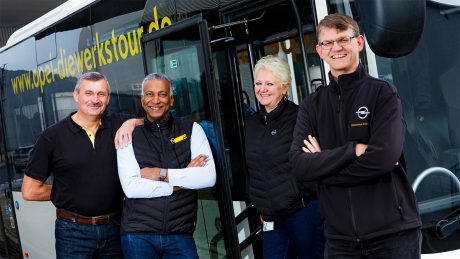 Das Team, das den Besuchern in Rüsselsheim die Faszination Automobilbau nahe bringt: Dimitrios Salabasis, Irina Scherer, Ramesh Niebling und Viktor Zobel (von rechts). The Opel plant tour guides who accompany the visitors like to hear that. Hearing charming, informative explanations about a modern production facility is one thing; talking to fellow workers like Michael Heilmann is another. They’re the ones who give the main plant a face, who give visitors an impression of who is building ‘their’ car. Next stop, Classic workshop: Viktor Zobel drives guests safely from station to station. 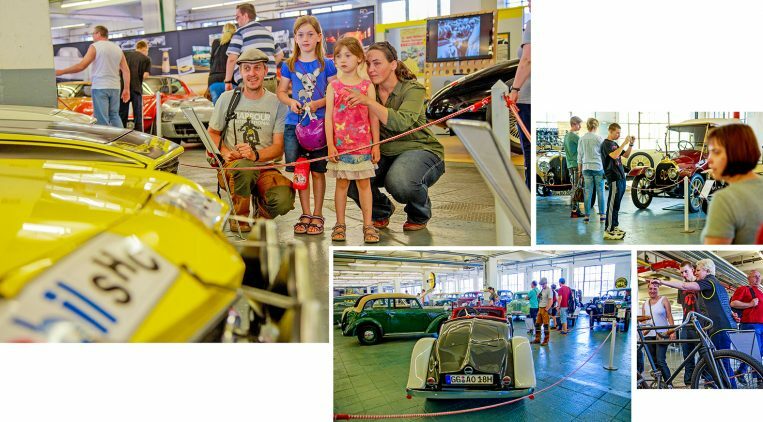 Many visitors experienced the fascinating world of automotive manufacturing in Rüsselsheim again in 2018: More than 600 tours brought a total of 14,000 visitors to the plant. A plant tour takes two hours. The tours start at the Adam Opel Building on workdays at 10:00 a.m., 1:15 p.m., and 3:30 p.m. That’s where tour guides Irina Scherer, Dimitrios Salabasis, and Ramesh Niebling take turns greeting guests; Viktor Zobel always drives the bus. The tour stops at the Classic workshop, the pressing plant, chassis construction, and final assembly and finishing. The paint shop, however, isn’t part of the tour because of its high security requirements and the demands of dust protection. “Our guests should experience manufacturing in an up-close and personal way, but we don’t want to stick them into protective gear,” explains Dimitrios Salabasis. On the tour, visitors learn interesting things about production – how many liters of paint does it take to paint the Insignia? 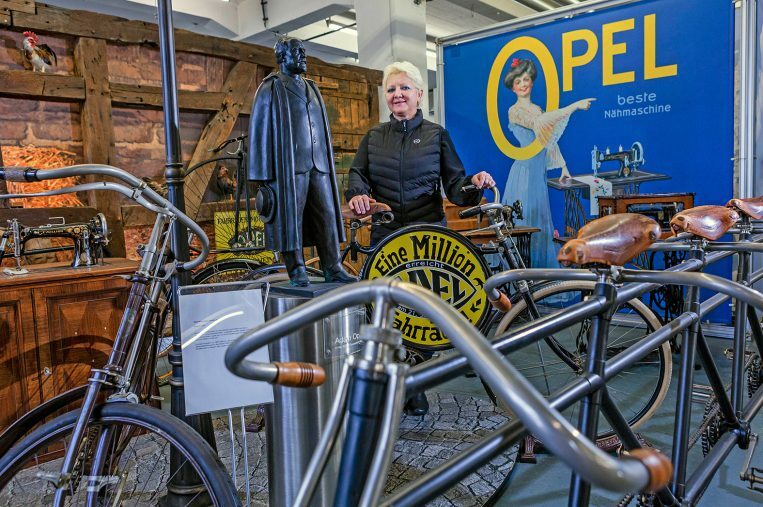 – as well as the company’s 157-year history, moving from bicycles to classic automobiles to the current models. “Children sometimes come with their own drawings of their dream cars, the ones they want us to build in Rüsselsheim,” says tour guide Irina Scherer with a smile. This means the tour guides have to be well-prepared and always stay up to date. This is done in a regular exchange with the communication experts of the individual divisions, because figures, data, and facts are the most important work tools used by the plant guides. And if one of the guides actually gets a question they can’t answer, then they can either get the answer directly from the relevant expert by telephone or send it over later via e-mail. “We leave no question unanswered,” says Irina Scherer of their creed. Leaving no question unanswered: Irina Scherer in the Classic workshop. Their true quality shows itself, as in every good team, not only in how they master the obligatory part of their job, but above all in how they can improvise. Improvisation, spontaneity, quick-wittedness – these are the qualities that make the plant tour experience a real pleasure. For example, Ramesh Niebling, who hails from India, thrilled a group of visitors from his homeland when he played a hit from a current Bollywood blockbuster during the bus ride. Because he comes from the South Asian country himself, Niebling knows all about its popular culture. Dimitrios Salabasis can help out with Greek if necessary, and Irina Scherer spontaneously switched from German to Russian when she realized that the current group was made up of tourists from her home country. This was a spontaneous service that the guests appreciated, and it showed how close the team is and literally exemplified an important Opel brand value. In addition to linguistic flexibility, the team always wants to find a language or style that fits the target group. At the top of the list is using language suitable for children. But boredom never comes up, because in the next group engineers want to be guided through the factory site again. The team is also prepared for visitors with physical or mental disabilities. 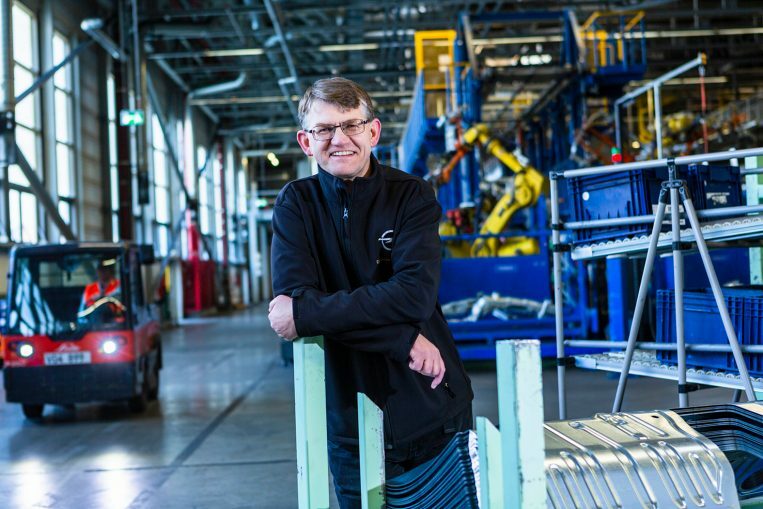 “For wheelchair users, for example, we have developed our own barrier-free paths through the plant,” explains Viktor Zobel. Fascinating robot park: Dimitrios Salabasis at his favorite station, chassis construction. According to Uwe Deller, Head of Internal Events and Plant Tours, the language offering will be expanded in 2019. Since Opel has become part of Groupe PSA, more and more tours are being requested in French. And the same applies to taking care of guests, which has always been the case throughout the company: Top quality is a key to success! This is why the plant guides want to offer more special tours in the future and tailor them even more closely to the various target groups. “Opel clubs want to spend as much time as possible in the Classic workshop, and technology students want to immerse themselves even more deeply in current production. We will take this into account by concentrating more on closed special tours,” explains Deller. The focus is also on the 120 years of automobile construction that Opel celebrates in 2019. The fact that the team is prepared for the tasks ahead was only confirmed last year. “In 2018, despite changing conditions, we achieved all the targets we had set ourselves and, in some cases, already met the target figures for the year in October,” said Deller. He knows songs from Bollywood blockbusters just as well as all of the facts about manufacturing: Ramesh Niebling. In addition to the mere numbers, it is above all the personal contact with many different people that makes the plant tours so attractive. Everyone on the team agrees that the best part of their job is the original ways in which guests express their thanks. “They often write to us again after a guided tour, sometimes even with their own drawings,” says Irina Scherer, who hung up some imaginative designs of future Opel models in the team office, painted by visitors who felt inspired by the tour. In one case, a visiting male choir expressed their thanks in a creative, musical way: They performed a personal serenade for Irina Scherer in the foyer of the Adam Opel Building, a rendition of ‘True Love’ by Leoš Janácek. After all, Opel’s large stages host more than just final assembly and finishing. The plant tour takes place three times a day, starting at the Adam Opel Building, and includes the Classic workshop, the pressing plant, body shell construction, and final assembly and finishing. You can register for a plant tour at https://www.opel.de/ueber-opel/opel-werkstour.html. You can also contact the plant tour team by email at DieWerkstour@opel.com or by telephone at (+49-6142) 765-600. Always ready to go: Dimitrios Salabasis, Irina Scherer, Viktor Zobel, Ramesh Niebling, and Uwe Deller (from left to right). Although she’s not in the photo, Petra Schuffenhauer, our faithful helper in the office, is another important pillar of the team – she addresses all administrative concerns.